Rescue Team is rated 4.0 out of 5 by 30. 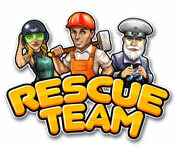 Rated 5 out of 5 by Debspals from Rescue team I love the Rescue team games, will there be a #7? Rated 5 out of 5 by KimK27 from Challenging, cute, fun TM game I'm not the biggest TM game fan, but there are a few I really like and this is one of them. If you've played and enjoyed Roads to Rome, you'll probably like this one too. There's some strategy involved here, figuring out what to do when and if you really do need to remove all the obstructions or if there might be another, less expensive way to reach your goals. The levels aren't necessarily increasing in difficulty as the game progresses; some of the lower levels took several tries for me to finish at the "gold" rating and some later ones took only one try. There's not much in the way of storyline, but I play adventure games for that. The graphics and sound are maybe a little childlike, but not annoyingly so. The workers say "happy!" when one of them or a citizen is rescued. I find myself saying "hurry hurry hurry!" as the last worker is running along if I'm very close to beating the clock. 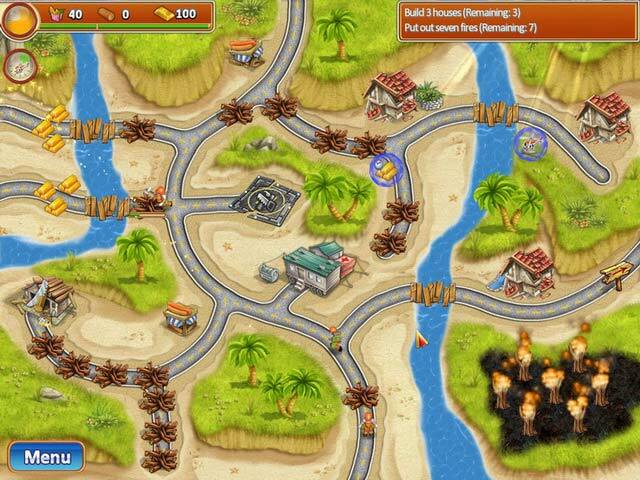 The game is engaging and fun to play. A quibble: I wish the circle indicating where I'm clicking to assign a task to a worker would NOT be green if I have no workers available. It's red if the way is blocked or there aren't yet enough resources available. But I did get used to keeping an eye out for worker availability. Definitely worth an hour of play to see if you like it; I think you'll enjoy the challenge. Rated 5 out of 5 by Bwgirl from Excellent Fun! Good clean fun. No occult themes hidden in the game. I've played this game over and over again. Wish there were more repairs to make to the main town (more reasons to earn more money) but all in all it is a very enjoyable game. Was happy to see the second one. 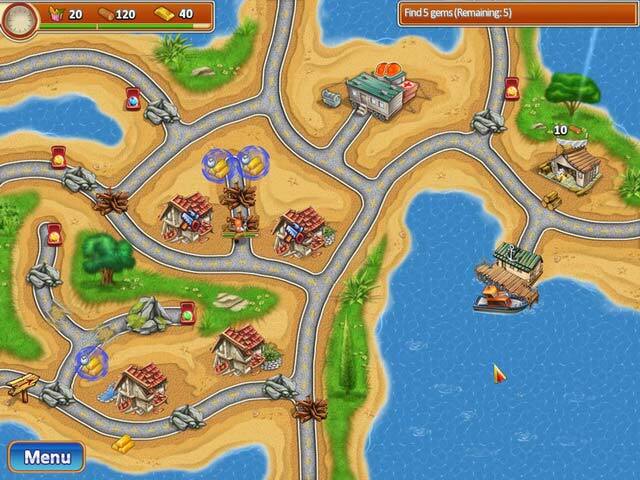 Rated 5 out of 5 by Hammhocks from Fun "Time Management/Builder" Game I had a great time with this game. It isn't my favorite in the category but... I'm happy with my purchase. :) The length was great (60 levels). I had to replay several levels (some of them several times) to get "gold". You really have to be on-the-ball to finish before the clock on many levels. The reason I didn't mind replaying some of the levels was because it wasn't as difficult, as some games in this category, to figure out a different strategy. Some people don't like that the repairs on the house were, typically, completely well before the end of the game. That didn't bother me at all. Some people also don't like that you can't "advance queue" your workers. That didn't bother me either. That's part of the challenge of the game. I don't know if it's something I did, or maybe I just missed it completely but... after I had finished all 60 levels (all gold)... The next screen that came up was the map. I didn't see the little arrow telling me what level was to be played next so I assumed I was going into bonus levels. Not the case. It took me back to level 1. I didn't get a screen telling me how wonderful I am to have saved all these people and places. ;) If you're looking for a game with a "doable" challenge that isn't completed in a couple of hours, give this one a try. Rated 5 out of 5 by DTex354 from Addictive time mgmt game With 60 levels it took me awhile to complete them all and each one offered a different challenge requiring me to develop a strategy. I went back and replayed any level that I didn't master and still had fun doing it. My only complaint was that I finished the repairs to the house early on and there was no further incentive to keep playing, other than my own obsessive nature :-) This is a good one for time mgmt fans. Rated 5 out of 5 by hawaiifrycat from The Most Enjoyable Time Management Game I find many of the time management games out there tedious, boring and maddeningly difficult. This game is an absolute pleasure! It's challenging and fun. I love the way the little guys run around accomplishing their tasks. The thing I love most about Rescue Team is that no one has smoke coming out of their ears or is going red in the face with impatience. I get my fill of unhappy people in the real world, I don't need them in my free time as well. The visuals are cheerful and light. And EVERYBODY cheers for you when you complete the goals. How great is that?! 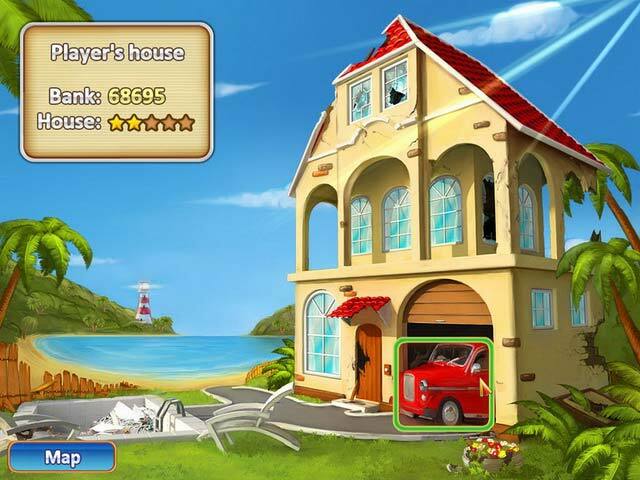 Rated 5 out of 5 by Qwiz from Great game Great game, needs more levels!